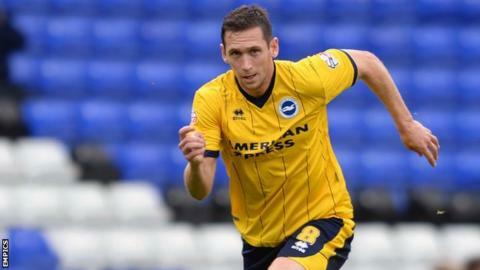 Andrew Crofts secured Brighton's third Championship victory on the trot with his winner against Wigan Athletic. Latics goalkeeper Lee Nicholls had made an excellent save from Jake Forster-Caskey's header to deny the visitors. But he was beaten when Crofts scored his fifth goal of the season with a looping 72nd-minute header. Wigan went close to a 90th-minute equaliser but Brighton keeper Tomasz Kuszczak kept out striker Grant Holt's header with a diving save. The Latics had been unbeaten at home in all competitions but Brighton's win ended that run. Wigan had the first sight of goal through Leon Barnett, who met Ben Watson's sixth-minute corner at the near post but drilled his shot well wide. Watson was then unlucky not to give the FA Cup holders an 11th-minute lead when he blasted just wide after a neat one-two with Marc-Antoine Fortune. After the break, Ashley Barnes crossed from the left for an unmarked Forster-Caskey, who headed straight at Latics keeper Lee Nicholls. Holt then failed to capitalise on a one-on-one with Kuszczak shortly before Crofts put Brighton in front. Craig Conway nearly doubled the visitors' advantage after cutting inside and unleashing a stinging shot at Nicholls, who parried the effort wide. Kuszczak then saved from Holt to ensure the Seagulls remain unbeaten on the road since September. "There's a bit of anger because we'd been unbeaten here and wanted that to continue. You can feel sorry for yourself or bounce back quickly, and that's what we'll do. "We have to be ruthless and more clinical. We will continue to try and add to the striking department. "Grant Holt doesn't lack confidence, he's a great lad. He's an outstanding player and will score many goals for Wigan." "I am very pleased and proud of my players because all of them gave 100% and if you don't work hard it's impossible to win here. "I'm pleased because no other team has won here and to be the first to do it means a lot to us. "We had some good chances to score and they had one or two but we took our chance and it made the difference." Match ends, Wigan Athletic 0, Brighton and Hove Albion 1. Second Half ends, Wigan Athletic 0, Brighton and Hove Albion 1. Foul by Adam El-Abd (Brighton and Hove Albion). James Perch (Wigan Athletic) wins a free kick on the left wing. Substitution, Brighton and Hove Albion. Adam El-Abd replaces David López. Stephen Ward (Brighton and Hove Albion) is shown the yellow card for a bad foul. Corner, Wigan Athletic. Conceded by Andrew Crofts. Attempt blocked. Nick Powell (Wigan Athletic) header from the centre of the box is blocked. Corner, Wigan Athletic. Conceded by Tomasz Kuszczak. Attempt saved. Grant Holt (Wigan Athletic) header from the centre of the box is saved in the bottom right corner. Assisted by James McClean with a cross. Emmerson Boyce (Wigan Athletic) is shown the yellow card for a bad foul. Craig Conway (Brighton and Hove Albion) wins a free kick in the defensive half. Attempt blocked. James McClean (Wigan Athletic) right footed shot from the left side of the box is blocked. Assisted by Grant Holt with a headed pass. Corner, Wigan Athletic. Conceded by Bruno. Attempt missed. Craig Conway (Brighton and Hove Albion) left footed shot from a difficult angle on the left misses to the left. Liam Bridcutt (Brighton and Hove Albion) wins a free kick in the defensive half. Foul by Ashley Barnes (Brighton and Hove Albion). Ryan Shotton (Wigan Athletic) wins a free kick in the defensive half. Offside, Wigan Athletic. Ryan Shotton tries a through ball, but Grant Holt is caught offside. Attempt saved. Jake Forster-Caskey (Brighton and Hove Albion) left footed shot from the left side of the box is saved in the bottom left corner. Assisted by David López with a cross. Substitution, Brighton and Hove Albion. Liam Bridcutt replaces Rohan Ince. Substitution, Wigan Athletic. Jordi Gómez replaces Callum McManaman. Craig Conway (Brighton and Hove Albion) wins a free kick in the attacking half. Attempt saved. Craig Conway (Brighton and Hove Albion) right footed shot from the left side of the box is saved in the centre of the goal. Assisted by Bruno with a cross. Goal! Wigan Athletic 0, Brighton and Hove Albion 1. Andrew Crofts (Brighton and Hove Albion) header from the right side of the six yard box to the bottom left corner. Attempt saved. Jake Forster-Caskey (Brighton and Hove Albion) header from the centre of the box is saved in the centre of the goal. Assisted by David López with a cross. Attempt missed. Grant Holt (Wigan Athletic) right footed shot from the centre of the box is close, but misses to the right. Ashley Barnes (Brighton and Hove Albion) wins a free kick on the left wing. Foul by Ryan Shotton (Wigan Athletic).